Years ago, in 2009, we were guests of Google at their headquarters in Mountain View, California (see our personal blog posts : 11/13/09 post, second post. The joint webinar we did with the Picasa team at Google is still viewable on Youtube it’s called Picasa Basics Webinar. I remember discussing with them the direction of Picasa and telling of how our audience wanted … needed … simple tools. At that time, their mission was to improve Picasa, to build more sophisticated photo editing tools that professional photographers wanted. Our opinion was that the power was in the simplicity and we lobbied for the simpler path. 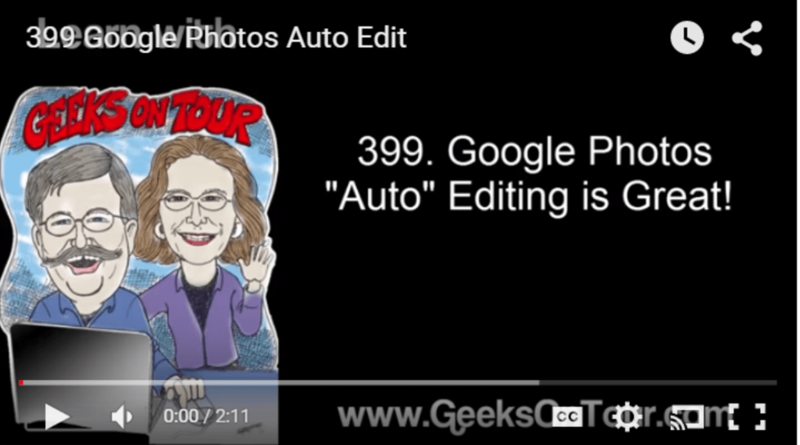 If you want to learn more and start using Google Photos, become a Geeks on Tour Member and watch our series of videos on Getting Started with Google Photos. Published by MrsGeek, in Blog. Tagged with #GeeksWhoTeach, Android, Droid, Geeks on Tour, Google Photos, iPad, iPhone, photo editing, Smartphone photography, Smartphones.